In the four years since I retired, I’ve been enjoying the time and energy not only to expand my garden but also to expand my knowledge of gardening. 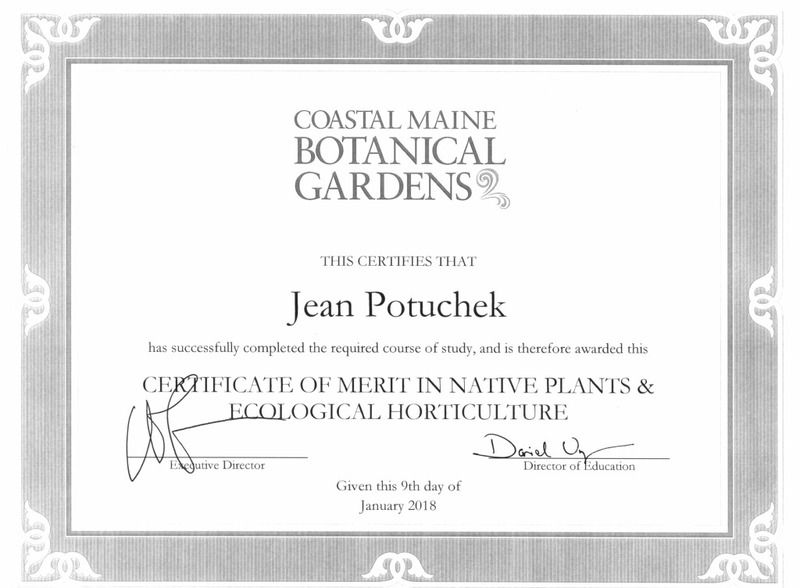 My post-retirement formal education as a gardener began with taking the Maine Master Gardener Volunteer certification course and continued with enrolling in the certificate program in Native Plants and Ecological Horticulture at the Coastal Maine Botanical Gardens. Both were wonderful learning experiences. The Coastal Maine Botanical Gardens program is flexible, allowing enrollees to complete the fourteen short, intensive courses needed for the certificate at their own pace. When I first enrolled, I thought it would take me 4-5 years to finish, but I loved the courses so much that I ended up earning my certificate in three years. Recently I attended a dinner celebration with other new graduates and program faculty and was officially awarded my certificate. Happily, the completion of the certificate program does not mean the end of taking classes at the Coastal Maine Botanical Gardens. I’ve just been perusing this year’s new course offerings on the garden website and have already identified one that I intend to sign up for. As I’ve become more confident in my gardening knowledge, I’ve also begun to teach what I’ve learned to others, a natural progression for me after a forty-year teaching career. In recent years, I’ve developed three different presentations for the McLaughlin Garden Winter Lecture Series and then repeated these presentations for various garden clubs. Last year, I fulfilled some of my volunteer hours as a Master Gardener by preparing and teaching a two-hour class on “Invasive Plants and the Challenge of Ethical Gardening” for the local Senior College (a lifelong learning program that I am a member of). I will repeat that class this year as an Adult Education offering in a nearby city, and I will develop shorter versions of it for presentations at an Earth Day program in my town and at the McLaughlin Garden wildflower celebration in May. In addition, I will fulfill most of my Master Gardener volunteer hours this year by developing and teaching a four-week introduction to “Perennial Gardening in Maine” for the Adult Education program. Teaching these courses also develops my gardening knowledge. As every teacher knows, teaching is another form of learning as preparing classes and interacting with students about a topic deepens the teacher’s understanding. Kudos on your master gardener certification! And congratulations on embarking on a new kind of teaching as well. I wish I could attend some of your classes. There are relatively few offerings locally and, while The Huntington and LA Arboretum offer some good classes, the trial by freeway to get there usually puts me off. I’ve tried on-line courses but unfortunately most of those aren’t geared to the opportunities and challenges on my climate. Thanks, Kris. It was a great day for me when I discovered the education program at the Coastal Maine Botanical Gardens. I hope you are as proud of your accomplishments as you deserve to be. The classes you teach sound very interesting and I’m sure that anyone taking a class from you will benefit enormously. As always, I’m envious of your proximity to the Coastal Maine Botanical Garden and the classes it offers. Pat, I’m realizing how lucky I am to have these classes available. I’ve grown so much as a gardener by taking them and by getting more comfortable with the science of horticulture. Given their relatively remote location, I think the Coastal Maine Botanical Gardens made a good choice in having their courses by short and intense (usually 2-3 days for a course, and some even shorter). One of my classmates in several courses this year was a young woman from New Brunswick, who was coming down to Maine for a week or so at a time and taking two or three courses each time. One of my fellow graduates from the certificate program this year is from Maryland. What an inspiring account, Jeanne. I’m hoping to tap some of your learning. I’m especially eager to learn more about native plants here in Maine. Sarah, Let’s get together sometime to talk plants and gardens! Do you know Mark Richardson and Dan Jaffe’s book, Native Plants for New England Gardens? It’s a great compendium of garden-worthy native plants with information about the conditions in which they like to grow. Congratulations!! You should be very proud of yourself. This is a wonderful achievement! Thank you, Claire. I’ve been very excited by where my gardening education has been taking me. Dear jean, where is this class happening? I am from West Newfield Maine. I admire your blogs. 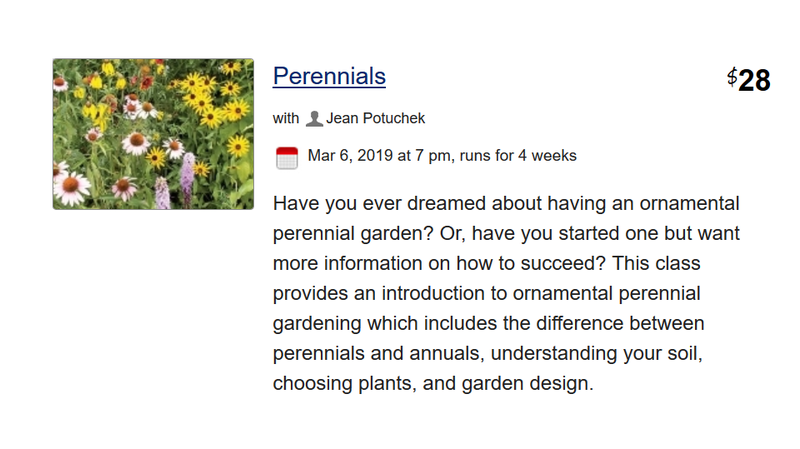 The Perennials class will be at Lewiston Adult Education — a bit of a slog from West Newfield. Here’s the link to their website if you want more information: http://lewiston.maineadulted.org/. Well done, Jean! I remember reading about when you first considering taking these courses and now here you are, not only graduated (early!) but teaching courses yourself! It’s a great achievement. Thank you, Sunil. I have always loved going to school, both as a student and as a teacher. Getting to take this love in a new direction is one of the great gifts of retirement. Congratulations on your new certification! Once a teacher, always a teacher! So glad you are using your botanical interests and talents to teach others. Your rewards extend far beyond the garden. Thanks, Deb. Getting to combine gardening and teaching definitely puts me in my happy place!